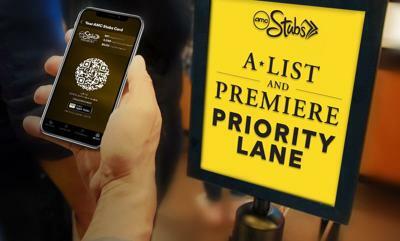 Hey all, if you have been following the never-ending battle of the subscription theater service, it would appear that many of Moviepass’s fans have jumped ship to offers like Sinemia and AMC A-List. I count myself among the A-Listers, having left Moviepass earlier this year when they screwed me out of several movie tickets. I went to A-List, and I’ve been very happy with the choice. It was announced recently that AMC will be raising their monthly price in 15 states starting in 2019. I’m writing to you from Minnesota, so naturally, it’s time for me to move. No, in all seriousness, this may deter some viewers but it won’t deter me. I tend to see 6-10 films in the theater each month, so this is still a great service for me. It’s also still way better than Moviepass, which could have solved a lot of problems by simply raising their price a year ago. There are also going to be updates for reserved seating and online concession ordering, so look forward to that and more soon when the service updates on January 9th, 2019. So what do you think? 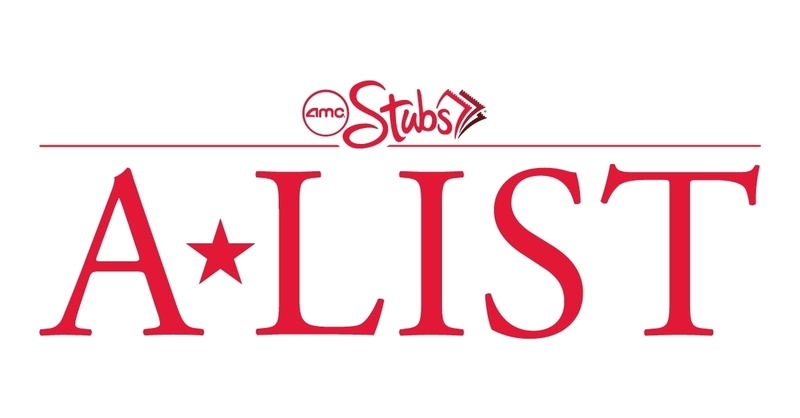 Are you an AMC A-Lister? What are your thoughts on the service and will you stay if the price does go up? Let me know/Drop a comment below. James Wan is a very busy man. It’s a wonder, with all the producing he does on films like The Nun and The Curse of La Llorona, that he has time to make a big tentpole film like the upcoming DCEU film Aquaman, but he does it. The first few trailers garnered some poor reviews for their CG. I personally didn’t find trouble with it, but I also understand that most trailers have unfinished CG. Wan’s film will be very CG-heavy, so it’s no coincidence that the film is just now wrapping Post-Production. I’m very happy for James Wan. I’ve been a fan of his since the original Saw film, which he directed. 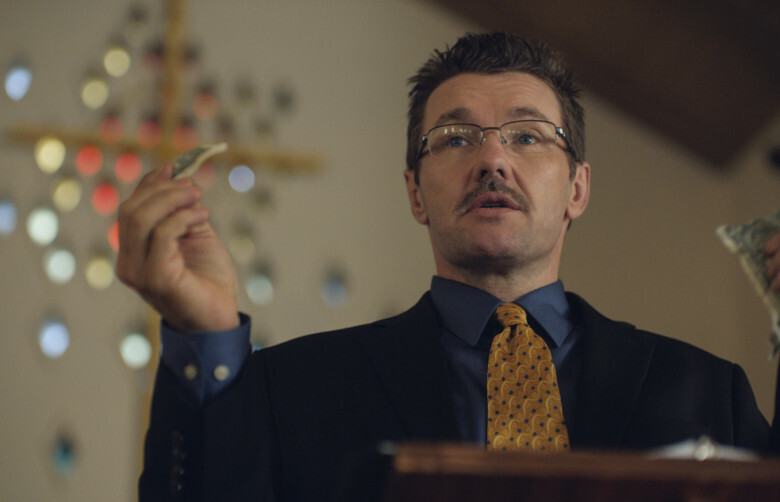 I’ve traced his path through a lot of horror and seen a director that consistently grows from each experience. His last big-budget feature Furious 7 was hampered with filming troubles after the sudden death of star Paul Walker, so I know he has dealt with stress quite well and his work shows focus and determination to deliver a superior product. I haven’t been excited for a DCEU film in some times as the cinematic universe has garnered its own share of criticism since its inception back in 2013. 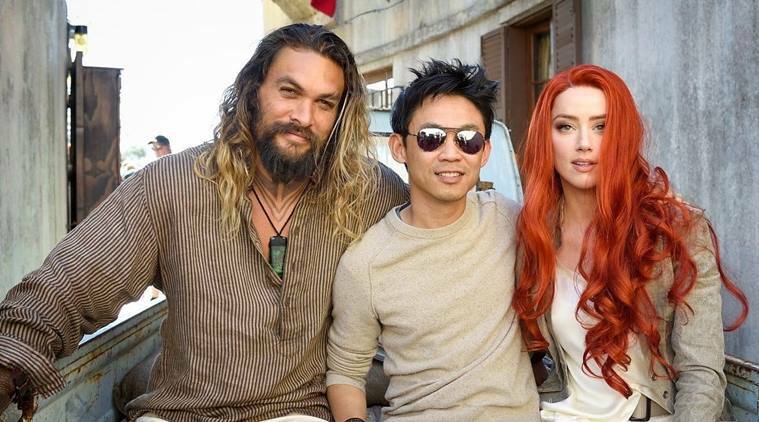 Well, it certainly makes me excited to see James Wan’s Aquaman next month. Aquaman surfaces in theater on December 21st. So what do you think? Are you excited for Aquaman. Let me know/drop a comment below. 141 mins. Rated PG-13 for some thematic content involving peril, and brief strong language. Damien Chazelle (Whiplash, La La Land) is working pretty hard to make up for the disappointing and embarrassing situation at the Oscars in 2017. 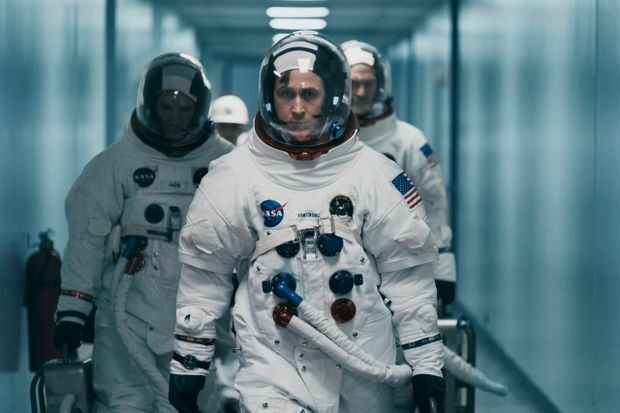 This year, he returns with the wildly ambitious biographical drama First Man. First Man chronicles the life of Neil Armstrong (Ryan Gosling, Blue Valentine, Blade Runner 2049) in the eight years leading up to the Apollo 11 mission, where Armstrong became the first man to walk on the moon. During that time, Armstrong experienced great loss in his personal and professional life, and the relationship with his wife Janet (Claire Foy, Unsane, TV’s The Crown). It also encompasses many of the trials, training, and missions that were required to get to the moon. Chazelle really excels with his character development. His strengths are characters that have trouble connecting to other people. He tends to have characters who are driven by a specific goal and cannot see how that goal is affecting those around them. 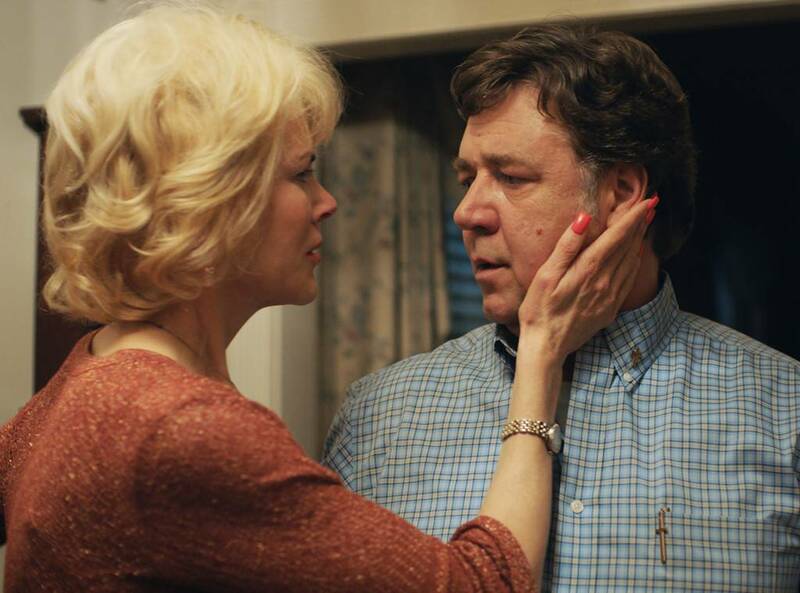 The relationship between Neil and Janet is so strongly built and examined in the film so that we as viewers can watch them strain and test their marriage with Armstrong’s excessive drive to complete his mission. Neil is running from the pain of loss in his life and as he gets closer and closer to achieving his goal, he finds that the losses continue to pile. 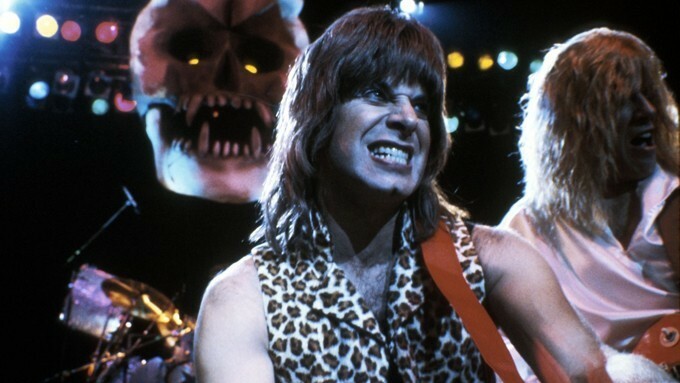 The film is magnificently shot. 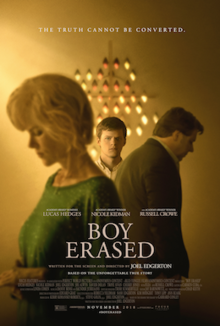 This is one of the most beautifully filmed pieces of cinema I’ve seen this year. The visuals are aged and elegant and they capture the feeling of the time. The gorgeous visuals are matched and juxtaposed with actual audio and video from the time. He uses this to convey a new sense of the time. So many films about the space program push for an America Pride angle with their imagery. Chazelle instead chose to show how pain and difficulty comes with this mission, and how many Americans viewed it at the time. 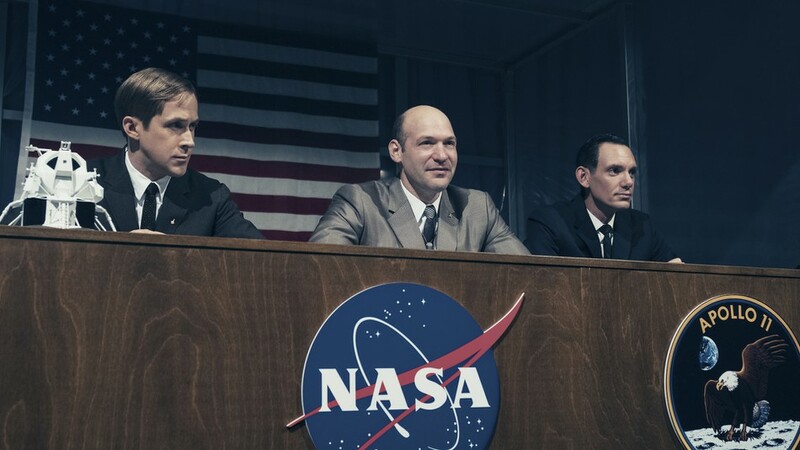 The question of whether or not this Space Race was worth it becomes a central argument in First Man, and it fits very well with the story that Chazelle is telling. The controversy about the flag plays in here quite heavily. It’s not really spoilery to say that we will see Armstrong on the moon at some point in the film, and when he does, I feel like many expected to see an American flag firmly planted on the moon’s surface, and while the flag is visible, it is not directly focused on. Some have complained about this (people who hadn’t seen the film yet and wanted something to be mad about), but again, Chazelle’s focus seems to be on the impact for Mankind and also on Armstrong’s personal journey. First Man is the first Universal Pictures film to use IMAX cameras, and they are only used for the lunar sequences, but those sequences just left me…breathless. I felt like I was actually on the moon with Armstrong. 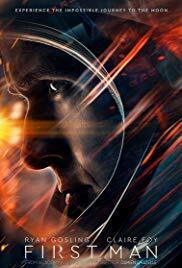 If you get the chance, see First Man in IMAX. It is worth it. The other area where Chazelle has an edge is his endings. All of his movies that I’ve seen have had such awe-inspiring endings, and First Man, while quiet and subtle, has an excellent ending that shows what was most important to Chazelle: character. I have so many things to say about First Man as I unravel more of what I saw, but this was quite an experience. The pacing was one area that seemed to be a struggle for me. Even though I loved the slow-burn, I felt as though the movie could have trimmed maybe 10-15 minutes, but overall, this is a tremendous achievement for Chazelle, who is just killing it right now. See this one in theaters. For my review of Damien Chazelle’s La La Land, click here. 135 mins. Rated R for language throughout, including racial epithets, and for disturbing violent material and some sexual references. 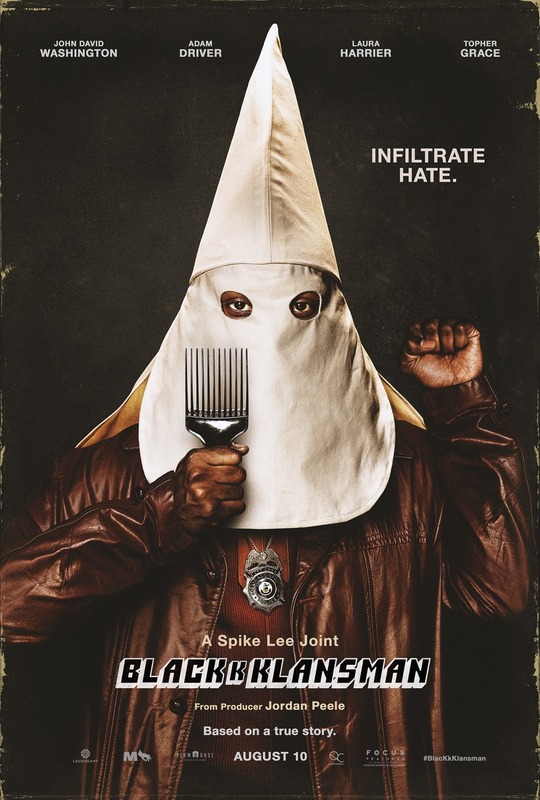 BlacKkKlansman kind of snuck up on me. I had no idea this film was coming out. I didn’t even know Spike Lee (Do the Right Thing, Rodney King) was working on a major project. 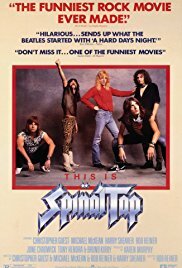 This film just kind of appeared one day. 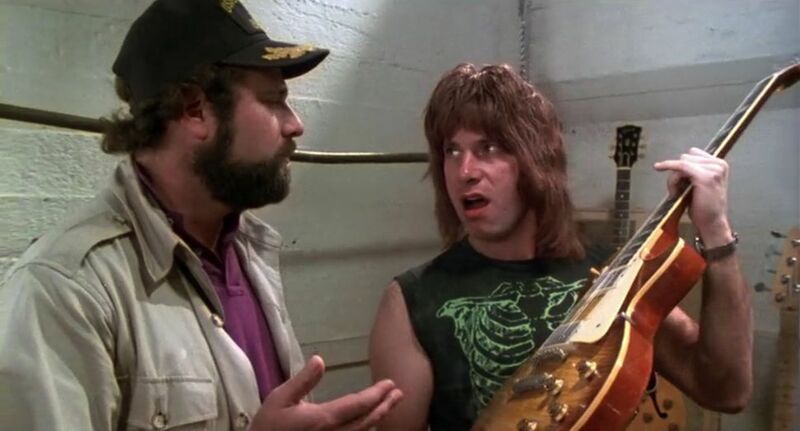 It’s one of those films that you almost can’t believe is based on a true story. This one more so than most. I had a feeling it would be an interesting film when I finally did hear about it. The shocking thing was just how damn good it was. The film is the so-crazy-you-won’t-believe-it true story of Ron Stallworth (John David Washington, Monster, TV’s Ballers), the first black officer in Colorado Springs. 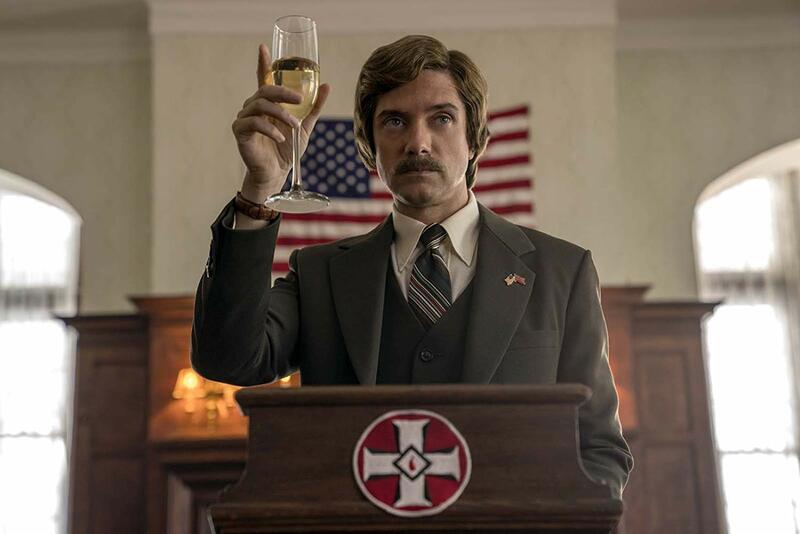 Moving from a lowly records position to an undercover assignment, Ron ends up posing as a white supremacist. Using a “white” voice on the phone speaking with members of the KKK and another detective, Flip Zimmerman (Adam Driver, Star Wars: The Force Awakens, TV’s Girls), posing as white Ron in public, he works his way up to the top of the KKK, eventually speaking to and sharing a room with David Duke (Topher Grace, Delirium, TV’s That ’70s Show), the Grand Wizard of the Klan. Now, Ron and Flip find themselves in an interesting and dangerous arena and must do all they can to expose the local chapter of the Klan before something unthinkable happens. I read somewhere that when Jordan Peele told Spike Lee about the project that Spike didn’t really believe it, and to be fair, it’s a hard story to believe. When Lee finally signed on, he had several important elements he wanted to infuse in the story: he wanted to heighten some of the more comedic parts of this larger-than-life story, and he wanted to make his film as relevant as possible to the current political climate. If that was his focus, he was damn successful. There are some historical inaccuracies in the film, namely that Stallworth apparently never used a “white” voice and it was just his own. The time the film is set was slightly adjusted as well. I don’t think less on the experience because I feel like these and other changes heightened the cinematic experience and impact of the story. True stories are never 100% true even if we try real hard. 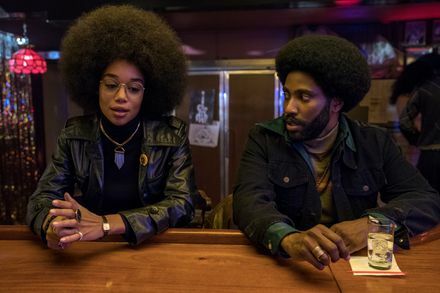 John David Washington is flat-out revelatory as Stallworth. He disappeared into the role and the two became one. I completely forgot I was watching a movie, I was so engrossed. Partnered up with Driver in a supporting role and it just melded so perfectly, but I have to mention Topher Grace’s performance. This is not something that I ever pegged him for, but his smarmy attitude and sinister calmness was haunting and strange. When Lee decided to infuse his story with even more relevancy than it had, he found a profound connection with our current political atmosphere, one that isn’t wholly new, but it is wholly unique to the director. There are references and lines, both major and minor, that firmly plant this story in present day, even though the film is set decades ago. There is a scene where two characters cast doubt that America will ever have a white supremacist for a President and it’s almost as if both performers looked directly at the camera and audience, pausing for desired effect. It’s unsettling with a dose of comedic. What I can tell you is that Lee’s film starts with a bang, a long speech by Alec Baldwin as the incredibly racist and hateful Dr. Kennebrew Beauregard. It also ends with a bang, one I won’t ruin for you, but I can say that when this film came to a conclusion, my jaw was hanging. I was so incredibly shocked by the ending that Lee chose to put to the film, and I think it is powerful, disturbing, and the perfect ending for this film. 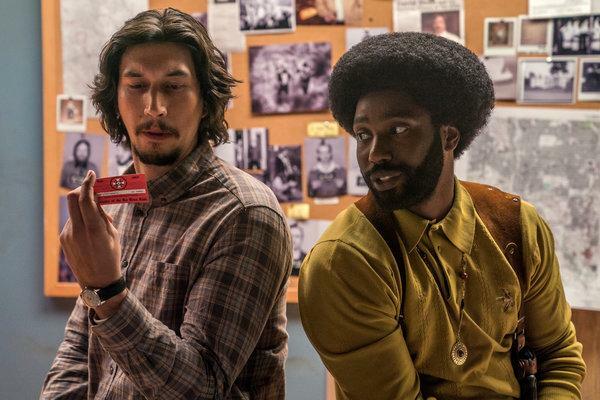 Spike Lee’s BlacKkKlansman is unlike almost any film I’ve seen this or any year, and it stands as one of my favorites. It seems to fire on all cylinders, and even though the first act takes a few minutes before it really kicks into high gear, I’m merely nitpicking an incredible experience, one that I hope you’re ready for. 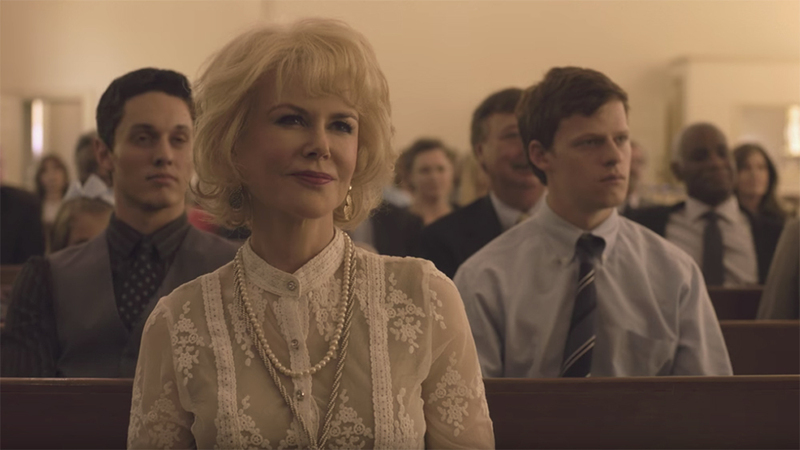 This is maybe one of the most important films of this year or any other. See this movie. 118 mins. Rated PG for action sequences and some brief mild language. Incredibles 2 was about to become a thing of legend, an anticipated film that seemed to never come. I didn’t believe it myself until the first teaser, but here we are. So then the real question comes, was the wait worth it. Thankfully, yes, it really is. The sequel picks up right where the first film left off, with The Underminer’s attack on the city. This event triggers more government scrutiny on masked vigilantes, until Bob (Craig T. Nelson, Book Club, TV’s Coach) and Helen (Holly Hunter, The Piano, TV’s Here and Now) are offered to be sponsored by Winston Deaver and the company he runs with his sister, Evelyn. 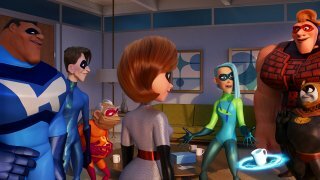 Elastigirl is the first step of the plan to ease the public’s view of heroes because she tends to cause less property damage, leaving Bob behind to take care of the kids. As Elastigirl hunts down the villainous and mysterious Screenslaver, a criminal who uses television screens to hypnotize his victims, Bob struggles to teach Dash (Huckleberry Milner) about New Math, help Violet (Sarah Vowell, A.C.O.D., Please Give) get through boy troubles, and figure out just what the deal is with Jack-Jack. The first thing to note with Incredibles 2 is how well-structured the film is, especially for picking up right when the first film ended. That’s not an easy feat if it isn’t thoughtfully planned out ahead of time, and it doesn’t sound like the cliffhanger from the first film was planned to be actually resolved, but writer/director Brad Bird (Ratatouille, Tomorrowland) took the story laid out and enhanced the quality of the first film in the process, making a two-film arc that works really well together. These films are two sides of the same coin, and they are both all the better for it. Bird stated numerous times that he wouldn’t make a sequel until he had the right story for it, and Pixar gave him the time to do just that. An important element of a sequel gestating for 14 years is the need to grow with the audience. The Harry Potter franchise understand the need to grow with its audience, as did Pixar favorite Toy Story, but Incredibles 2 takes it a step further. The violence and adult content associated with the sequel is interesting and risky and proves that Pixar is not a company that makes children’s movies, but instead a company that makes animated films for everyone to enjoy. 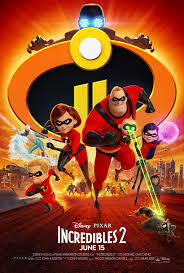 Incredibles 2 employs the first usage of a gun in a Pixar film as well as heightened language. Again, not issues from this reviewer, but I am proud that Bird is unafraid to grow with his audience and use what it necessary to make the film he wants to make. The voice work is exemplary here, especially Holly Hunter’s work. She gets a lot more to do here with the lead character swap of the sequel. This is not an easy feat for sequels as well, especially when thinking about Pixar’s previous failure in character-swapping Cars 2. It was disastrous there and it works quite well here, mostly because Helen was a well-written, well-defined character in the first film, whereas Mater was comic relief and never that well-rounded to begin with. It’s nice to see the reversal and how it affects Bob. He is someone that doesn’t think about anything but saving lives and defeating evil, so forcing him to stay in the shadows is an interesting character arc. I didn’t like how his story roped in Edna Mode, but I can live with it. I was able to relate to him more as a character due to the difficulty he has to face in day-to-day minutiae. The Screenslaver is an interesting villain this time around. It’s nearly impossible to top Syndrome with the uniqueness of the villain this time around, but I did enjoy the hunt. The big problem from a story perspective is how simple it is to figure out the identity of the Screenslaver. I was putting it together rather easily, and the clues are there. Maybe I was the only one, but I felt it was a clear direction. I suppose there should be some discussion on the controversy here. Yes, Incredibles 2 has some sequences involving flashing images that may be harmful to people with epilepsy. It was definitely straining to my eyes, and I don’t usually have trouble with that, but I left the theater with a headache. Is it a problem? Yeah, kind of. This was a poor decision and I’m surprised no one thought about the effect it would have on the big screen. I think, at home, it won’t be an issue,but this was a major mistake. There were other ways to make these sequences work on film. Still, I’d rather watch this sequence than discuss the other controversy the film has: public outcry over the lack of “The” in the title (seriously, this was also a thing). Incredibles 2 is an all-around wonder of a film, and though it isn’t as strong as the first film (but really, that’s a tough ladder to climb), it is still quite an exceptional experience. Barring some pacing issues in the second half of the film, Incredibles 2 is a well-structured and emotionally resonant sequel that moves its core group of characters forward in new and exciting ways. This is definitely one to see.